Bhopal: BJP president Amit Shah on Monday addressed party workers in Madhya Pradesh’s Rewa district and spoke about how the party turned around its fortunes due to the “sacrifices of five generations”. Shah, who is on a two-day trip to the state, told the workers that they were fortunate to be a part of the Bharatiya Janata Party (BJP) at a time when it was winning and added that this was not always the case. “There was a time when celebrations happened when any party candidate saved his security deposit and now we are a party of 11 crore workers,” he said. The party chief said the BJP had seen a lot since 1950 and the change in the organisation had been brought about by the sacrifices of five generations. Shah told workers that the elections were not for forming the government but “uprooting the Congress completely”. He also gave the slogan of 200 plus seats in the MP assembly polls. Attacking the Congress, Shah said party president Rahul Gandhi was dreaming of a win in the land of Kushabhau Thackrey and Rajmata Vijaya Raje Scindia. He also accused the UPA rule of depriving Madhya Pradesh of sufficient funds for 10 years. “When Rahul baba question Modi government’s achievements of four years, he should have the courage to answer why MP was meted out step-motherly treatment during UPA rule,” said Shah. He referred to the implementation of the National Register of Citizens (NRC) in Assam, accusing the Opposition of shielding infiltrators and not sparing a thought for those who lost their lives in terrorist activities triggered by intruders. 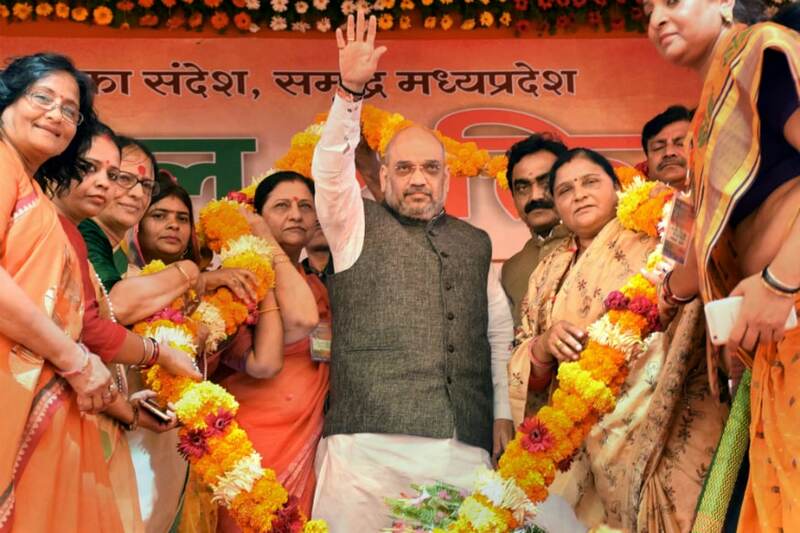 Earlier in the day, Shah addressed the Kamal Shakti women convention in Satna and emphasised on the empowerment schemes launched by the Modi and Shivraj governments. Remembering the contribution of Rajmata Vijaya Raje Scindia in BJP, Shah termed her a symbol of motherhood for BJP workers and alleged that the Congress had wreaked havoc on her during Emergency.